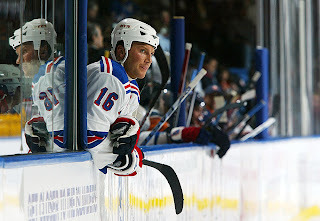 The New York Rangers are reported to announce at noon today that they are waiving Sean Avery. In deciding between two frustratingly inconsistent players, the Rangers decided to go with keeping the boring Erik Christensen as their final forward and waive the gritty fan favorite, Sean Avery. For sure, Avery has never endeared himself to Coach John Tortorella (even before he became the Rangers' coach), so in many ways the waiver is no surprise. The Coach likely will say all the civil things [see below for what the Coach did say which once again demonstrates I am no prognosticator about human nature] but this is just another step in transforming the roster into one that relies on speed, youth and multiple skills. Perhaps if Sean had scored more than 4 goals last season, had more consistency on the ice and reduced the number of momentum-killing offsides he would "create" every game, there may have been room for him. Perhaps if he was not targeted by the league and referees (unfairly) for his infamous comments in Dallas and became an on-ice distraction, he could have remained. 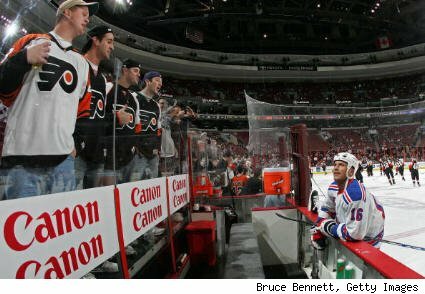 Perhaps more telling is that he had started to become a public distraction (originally starting off harmless - Vogue internship and opening a new restaurant - to the political - lobbying for gay marriage - to the embarrassing - the post-party encounter with L.A. police in June and his charge in late September against Wayne Simmonds for hurling a slur at him during a preseason game). His recent behavior made it easier to select the plain vanilla Christensen over Avery. In the final analysis, perhaps the Rangers decided that his $1.9 million salary for such paltry offensive performance (vs. Christensen's $900K salary) was a possible backbreaker, especially since the Rangers may be on the prowl for a quality veteran defenseman to replace the ailing Marc Staal. (The Rangers announced yesterday that Staal will miss the first 2 games of the regular season in Europe at the end of this week.) 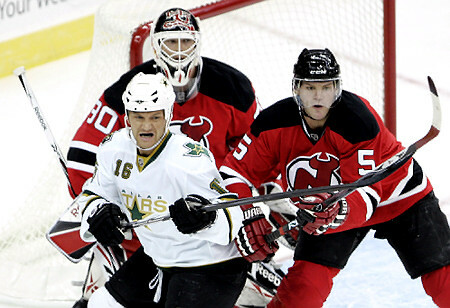 Now that the Rangers are down to 5 defensemen, they better be looking to reinforce the back line as they waived Stu Bickel and Brendan Bell while in Sweden. Apparently the team's bag charges will be that much cheaper as the team only has 20 active players now. Avery is an unrestricted free agent at the end of the season. So now we will see if anyone claims the enigmatic forward or if he moves on to Europe as his agent suggests. He certainly has a mix of offensive and defensive skills and he was definitely a fan favorite. We'll always have the "Avery Rule" and his battles with the Devils and Martin Brodeur will always bring smiles to the faces of Ranger fans especially when the Blueshirts beat the Devils in 5 games in the 2008 playoffs. But during last season, you could sense that he was wearing out his welcome with his uneven performances. Ultimately, to become an elite team that is not always straddling the playoff bubble, the Rangers cannot afford to carry players who cannot be counted on for a consistent standard of performance every game. Both Christensen and Avery are maddeningly inconsistent in extreme ways. Certainly, the Rangers cannot afford to carry 2 such players. 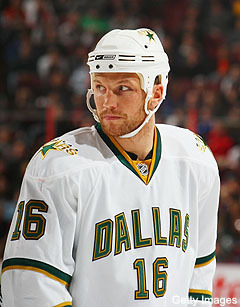 So #16 is the odd one out leaving Christensen to draw the ire of Ranger fans. 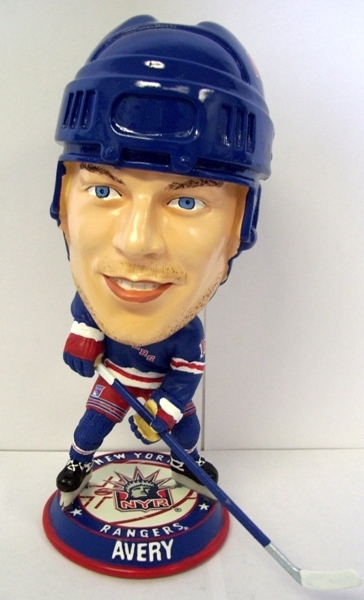 I don’t want to jam up Sean here - I think we have better players than Sean Avery, plain and simple. I can dodge it ten different ways, without trying to run Sean over. I thought he had a good camp. But I think with the makeup of our team, and some of the people we’ve added, and some of the youth we’ve added as far as depth put Sean in this spot. The players that are here are better than Sean Avery. Maybe not in the role or a couple instances Sean could help us in, but they’re more versatile in a lot of different areas. I’m trying to do this the right way, because I do not wanna keep on shoveling dirt over Sean Avery, but we have better players than Sean Avery, right now on the hockey club. THREE TIMES Torts had to say this? Give us a break. Who is he trying to convince -- himself, management, the fans? 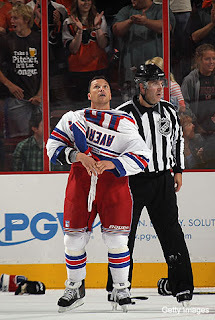 Below are some pictures to remember Sean Avery by . . . .
#30's worst nightmare on ice. Sean never looked good in this sweater. 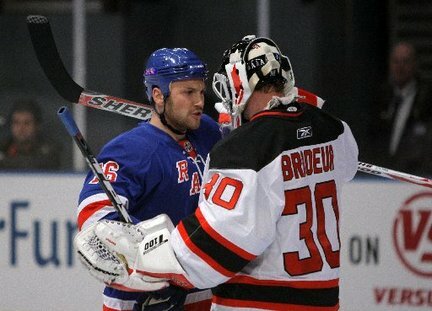 But Avery was Brodeur's nemesis regardless of the sweater he was wearing. Dance partners? I don't think so. prowling enemy arenas, here Flyer fans. Say Goodnight, Sean - you can leave your uniform right here. attack from an opponent and today from his former coach. As I can understand, a lot of fans are upset. Others not. For those that are upset, I wouldn't call it a loss of perspective. Aves is a PR nightmare, but he brings character and attitude to the team and a certain set of intangibles that get both teammates, opponents and (unfortunately) officials, fired up. All that was buried by the Coach. Yes, Torts will take blame for this. Salaries, publicity, bad reps and inconsistent play aside. It will always be noted that Torts had a b*ner, every time he saw Avery riding the bench. Even before the two were part of the same organization. Love him or Hate him, Sean brought a certain entertainment value and snarl to the game. When the guy was hated the most, he seemed to be play his best. Now that's all gone. Lets get one thing straight, for most of the Avery Fans this is not about Sean Avery as much as it is about Erik Christiensen. If he was waived in favor of Brandon Prust or say Brian Boyle (after his last season), the blow would be easier to take. He wasn't waived for one of those guys, he was waived for a guy that has shown to be just as inconsistent. In fact has a career of inconsistency. While both guys tend to coast sometimes when they could be charging up and down the ice, Avery had a far greater value as a guy that didn't have to score to affect the course of the game, while EC was the classic underachiever... 2 goals and 1 assist in one game and invisible for the next 13. While the coach may be looking at shootout goals or a vanilla type player that allows him to scramble lines every 2 seconds... Fans measure the game in passion and attitude. 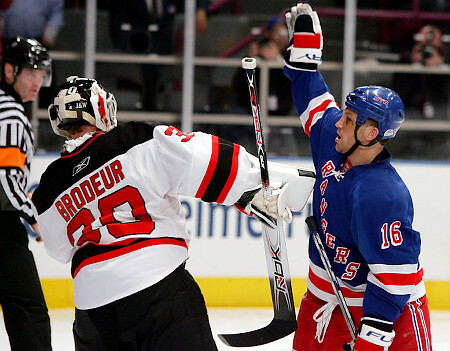 Fights, scrums, checks and rivalries are all fueled by passion and part of a great tradition of the game of hockey. In his low key pedestrian demeanor, Christensen often skates around and shrugs as if to say, "I don't need this job, but it passes the time." In fact, the closest I've seen Christensen to a fight is when when threw Avery under the bus to the reporters by critiquing a fight he had accused him of sucker punching. 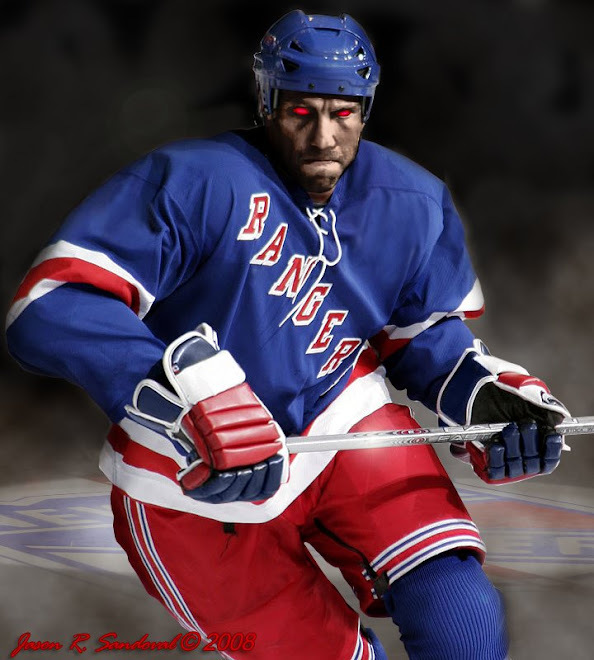 That, ladies and gents, is not a New York Ranger... We've had many a guy show up and put that sweater on over the years just to collect a check and had no idea what it was to be a New York Ranger. I guess somethings don't change after all. 2) We're gonna miss Sean and his unique personality/antics!